Montemerano was an intense stopover of the #mycornerofitaly tour. We experienced our first quad adventure, we took a break at the Saturnia hot springs (those you probably have already seen many times in pictures) and then we visited the tiny (but awesome!) burg. The quad trip was fun but intensive! 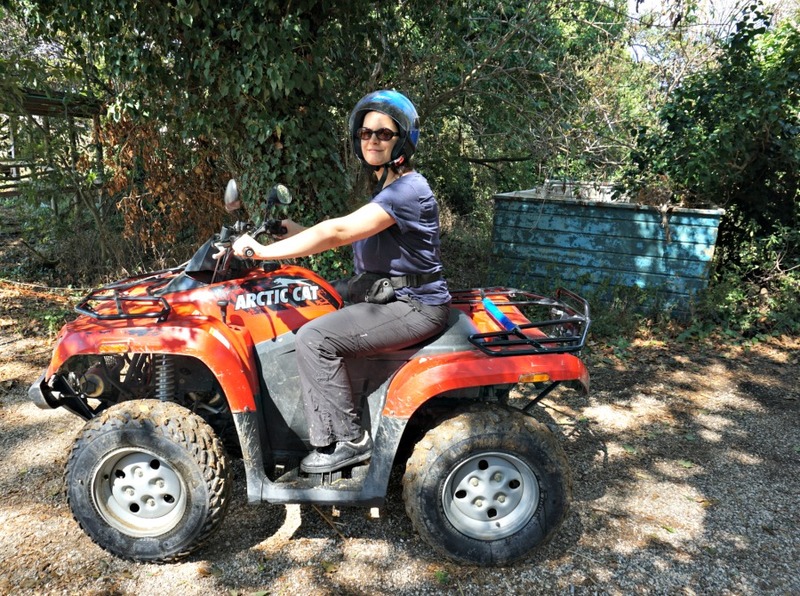 I had arrangements with the owner of a local agriturismo, so that my husband and I could share a quad. My husband drove the most of the time, I just drove for 10 minutes along the easiest part of the path. And the most panoramic too. I told the renter (who led us) that it was the first time on a quad for us. But he went too far! In fact I prefer not to write the name of the place. We drove through the countryside along unpaved roads. OK. We saw beautiful sights. OK. But in many stretches the road was very uneven and full of rocks. I don’t know how many bashes I took! We forded a river. Twice. The first time it was fun. The water was very low and nothing happened. But then we forded another river and got quite wet. Luckily we had extra socks and extra shoes in the car! It was fun, but it was also uncomfortable and not at all suitable for everybody. Honestly, I think that he should have brought us to more quiet paths in order for us to simply enjoy a different activity. We didn’t want to attend a Camel Trophy! Plus my shoes got ruined. Please subscribe to my YouTube Channel by clicking on the red button on the left! The hot springs called Cascate del Mulino (Mill’s Waterfalls) are an amazing sight: blue waterfalls flowing into small natural pools in the middle of a field. There is a small café 25 meters from the springs where you can rent lockers, have a shower and get something to eat and drink. But we didn’t stopped there. We preferred to have lunch in Montemerano. The area was full of people. The locals told me that the perfect time for the Cascate is late Autumn/Winter… not only to find no crowd but mainly because of the temperatures. It is not so pleasant to have a hot bath in August! The burg was built on the top of a hill by order of the Aldobrandeschi family, ruler of Maremma, during 1200. After being Orvieto’s subduction, Montemerano was conquered by Siena. The Sienese transformed it into a defensive fortress. Montemerano is in fact completely surrounded by medieval walls (three sets of walls to be precise). The doors grant the entrance to the burg: Porta del Ponte (where once there was a drawbridge – bridge is ponte), Porta della Canonica (Rectory) and Porta San Giorgio. There is an additional passage, created probably during the 1700s, called “la buca” (the hole). Pieve di San Lorenzo, the most ancient church of the village (XI). Since it is deconsecrated, it is used for theatrical representation and events. Piazza del Castello. A wonderful visual impact. You climb the steep street leading to it. 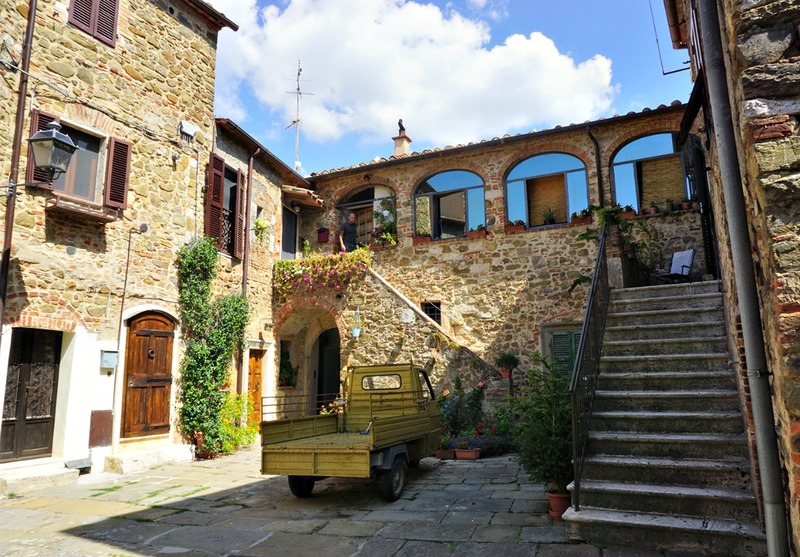 Get past an arch and there is the medieval piazza surrounded by stone houses of different heights, adorned with gladdening plants and flowers, a true gift by the citizens to themselves and visitors. The so called Castello, in the Piazza del Castello, is the former abode of the Aldobrandeschi family and then seat of the Town Hall until 1783, when Montemerano became just an hamlet of the near town of Manciano. Montemerano is a sequence of tiny piazzas, narrow alleys, quaint corners, smiling people who greets you while you disturb them with your photos and your intrusive glances. I adored Montemerano. I wanted to ask someone to adopt me! Montemerano is a true hidden jem. I had never heard of it before starting to plan the tour. And none of my friends did. 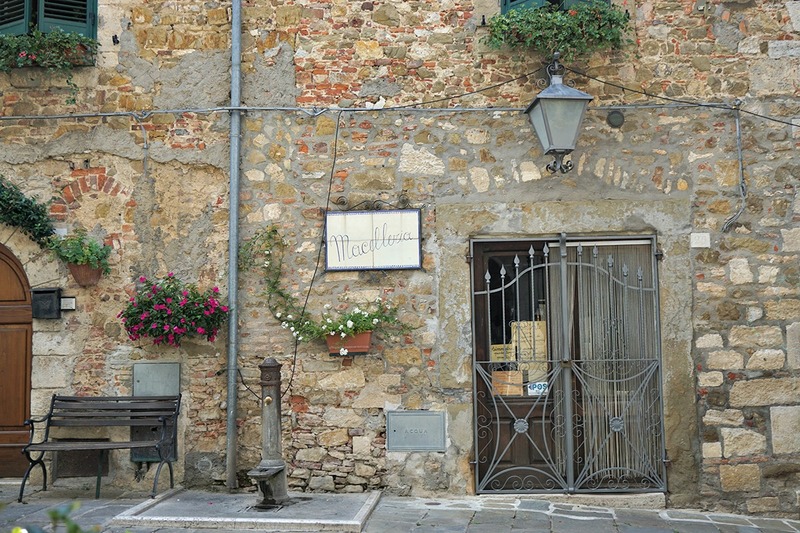 Yet it is listed as one of the most beautiful villages in Italy. You will love it as I did, wandering around and about its streets, its piazza and watching the time going by slowly as in a lost childhood lullaby.